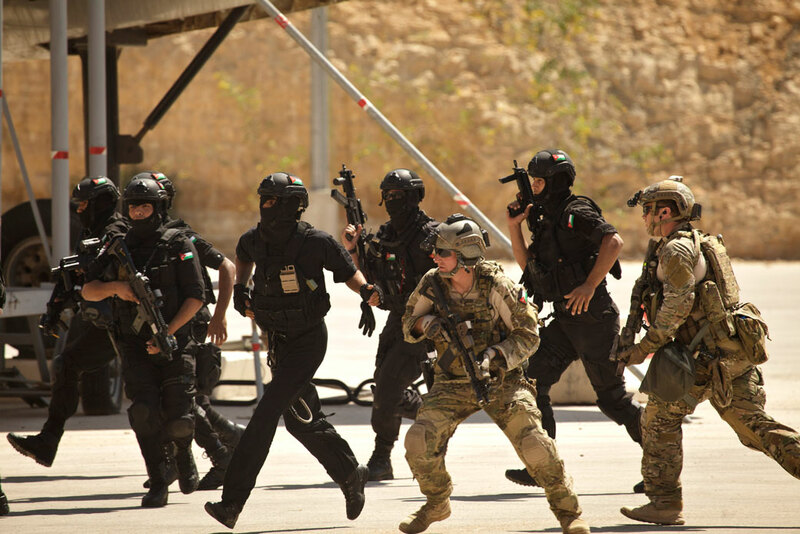 Special operations forces from Jordan and the United States conduct a combined demonstration at the King Abdullah II Special Operations Training Center (KASOTC) in Amman, Jordan, June 2013. As the United States and Jordan enter the next phase of bilateral counterterrorism cooperation, they should work together to continue to strengthen Jordan’s security services. Despite record aid levels, the internal security situation in Jordan took a turn for the worse in 2016. In that year, the kingdom suffered a string of terrorist attacks, including its most deadly in a decade. A number of factors appear to be at play. Civil war, IS, and a resurgent Al Qaeda in Syria have increased the threat along Jordan’s northern and eastern land borders. Domestic religious extremism also appears to be on the rise in Jordan. In addition, an estimated 2,000 to 4,000 Jordanians have crossed those borders to fight for extremist groups5 and many have begun to return home, elevating the threat of domestic attacks.6 Finally, Iran’s presence and power projection in Syria poses a strategic threat by creating instability and conflict along Jordan’s borders. These trends do not yet constitute a strategic threat to Jordan’s stability. However, the recent spate of internal terrorist attacks has raised concerns over the kingdom’s capacity to fully manage a dynamic and complicated matrix of threats emanating from inside and outside Jordan. As the region enters a new chapter in the fight against terrorism, the United States and Jordan will need to make important choices about how best to further strengthen the capacity of the kingdom to manage these threats. The first step should be an honest look at what has and has not worked, particularly in the wake of the 9/11 attacks, after which the United States made significant investments in counterterrorism partners in the Middle East. The good news is that Jordan has already taken steps to address gaps in its highly capable armed forces and security services. These institutions have historically enjoyed significant U.S. support, with most U.S. counterterrorism assistance flowing to partner organizations such as the General Intelligence Department (GID) and the Jordanian Armed Forces (JAF), including its special operations forces. Following the 2016 incidents, King Abdullah II replaced the minister of interior, as well as the leadership of JAF, the GID, and other security services. The personnel changes were designed to discourage interagency competition and improve coordination, and were welcomed by Jordanian and American security professionals alike. Other elements of the reform packages that followed the 2016 attacks deserve greater scrutiny. Of particular note is the restructuring and downsizing of the Jordanian Special Operations Command (JORSOCOM)—a longtime partner of the U.S special operations community housed under JAF. Jordanian officials described this as a move to strengthen their special operations forces, but there is a risk that the changes could actually diminish the operational effectiveness of these forces over time. In addition, while the shake-up in leadership may have improved coordination across Jordan’s security institutions, opportunities remain to strengthen the kingdom’s counterterrorism services and enhance cooperation across them. Clarify the objectives of the Jordanian special forces reform plan and articulate a vision for the role of special forces in future counterterrorism operations. Ensure that Jordanian special forces retain adequate aviation support for counterterrorism operations and improve its personnel recruitment and selection process. Maintain a U.S. special forces presence large enough to maximize the outcome of the reorganization of Jordanian special forces. Expand the participation of Jordanian special forces in expeditionary operations with U.S. forces. Enhance Jordanian counterterrorism coordination at the national and tactical levels. Regularize recruitment for Jordanian intelligence and review opportunities for additional technical support and enhanced cooperation with the U.S. intelligence community. Under the Obama administration, the U.S. Department of Defense (DOD) listed Jordan as its “top funding priority” among countries receiving support from the DOD’s Counterterrorism Partnerships Fund.19 U.S. security assistance to Jordan supports counterterrorism capacity-building—specifically training, equipment, and border security for JAF, including the Jordanian Border Guard, Jordanian Quick Reaction Force (QRF), and the Royal Jordanian Air Force. Key examples of each assistance category are provided below. In 2005, Congress allocated $99 million to build the King Abdullah II Special Operations Training Center (KASOTC), Jordan’s state-of-the-art special operations forces training facility.22 The center trains both Jordanian and international special operations forces and hosts Eager Lion, a major multinational military and special operations exercise. The United States conducts training courses for Jordanian special operations forces in counterterrorism operations, as well as military training for JAF to conduct counterterrorism operations. The United States also organizes trainings for the QRF in disrupting terrorist groups attempting to operate within Jordan’s borders. U.S. assistance provides operational equipment, such as body armor and ammunition, as well as special operations equipment for counterterrorism, such as night vision devices; weapons; munitions; and communication and electronics equipment. In 2015, the Obama administration denied requests for armed drone exports to Jordan for anti-IS operations,23 but the Trump administration could reverse this decision and approve the request. In 2009, the United States established the Jordan Border Security Program, an “integrated border security surveillance, detection, and interdiction system”24 along Jordan’s borders with Iraq and Syria.25 In 2016, the system became operational. U.S. assistance provides vehicles, equipment, weapons, munitions, and training for the Jordanian Border Guard to respond to border incursions by terrorist elements. Despite years of regional upheaval and conflict, Jordan has remained relatively stable. 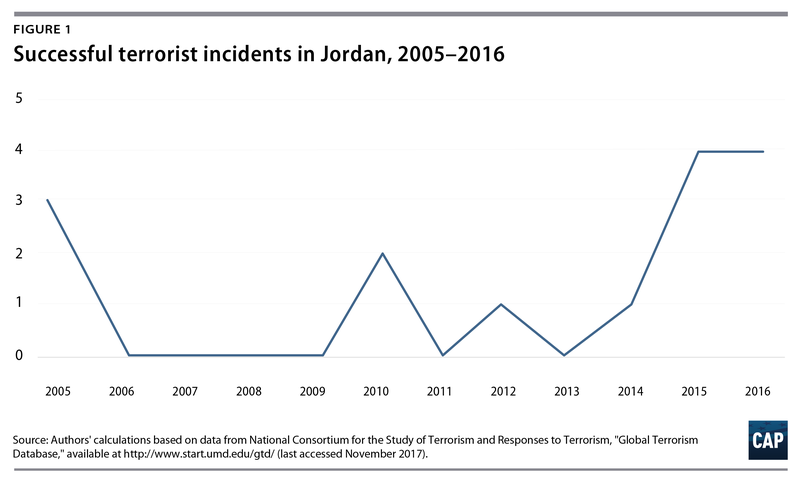 The last two years, however, have seen a spike in incidents and a general increase in the severity of the terrorist threat facing Jordan. The U.S. Department of State suggested this year that Jordan had become a target “for several reasons, including its proximity to regional conflicts in Iraq and Syria, the state’s official rejection of Salafi-Jihadi interpretations of Islam, and its membership in the Defeat-ISIS Coalition.”26 While terrorist threats facing Jordan remain largely domestic, the border area and foreign fighters are additional areas of concern. Jordan suffered several terrorist attacks over the past two years, all carried out by Jordanians and mostly directed at security and military personnel.32 In particular, four key incidents highlighted new threats faced by Jordan’s counterterrorism institutions. With the possible exception of the Irbid cell, these incidents do not appear to have been directly coordinated by IS or other transnational terrorist groups. However, Jordanian military officials elaborated that local terrorist cells and sympathizers have been galvanized and inspired by IS’s initial successes and its call for supporters to carry out attacks in their countries.46 They also observed that many of the attackers were prevented from exiting Jordan to fight with terrorist groups in Syria, but may not have been adequately monitored after being denied exit. Counterterrorism efforts in Jordan are led by Jordanian special operations forces and the GID, with the Border Guard, the PSD, and the Gendarmerie playing supporting roles. While these institutions have been successful overall, CAP’s research and interviews identified areas for improvement going forward, particularly for the special operations forces and the GID. Founded in 1963, Jordanian special operations forces have a series of primarily domestic missions, including reconnaissance; counterterrorism; search and evacuation; intelligence-gathering; and the protection of key sites. Their organizational structure has evolved significantly from a multitask, company-size parachute unit in the early 1960s to a brigade-size entity in the early 1980s, with more specialized units, including a parachute unit, special forces unit, and a small counterterrorism unit. Special operations forces gained prominence and resources in 1996 when then-Crown Prince Abdullah took charge and established JORSOCOM. At the time, Jordanian special operations forces were relatively small, consisting of three main units: the 101st, 91st, and 81st battalions. Under King Abdullah and subsequent commanders, JORSOCOM grew substantially. By 2016, the command consisted of three main brigades at a total strength on paper of 7,000 operators.68 The central pillar of JORSOCOM has been the 37th Special Forces Brigade, consisting of the 71st Counterterrorism Battalion, 101st Special Forces Battalion, and the 82nd Airborne Battalion. The 37th Brigade has been supported by the 28th Royal Ranger Brigade and the 5th Special Operations Aviation Brigade. 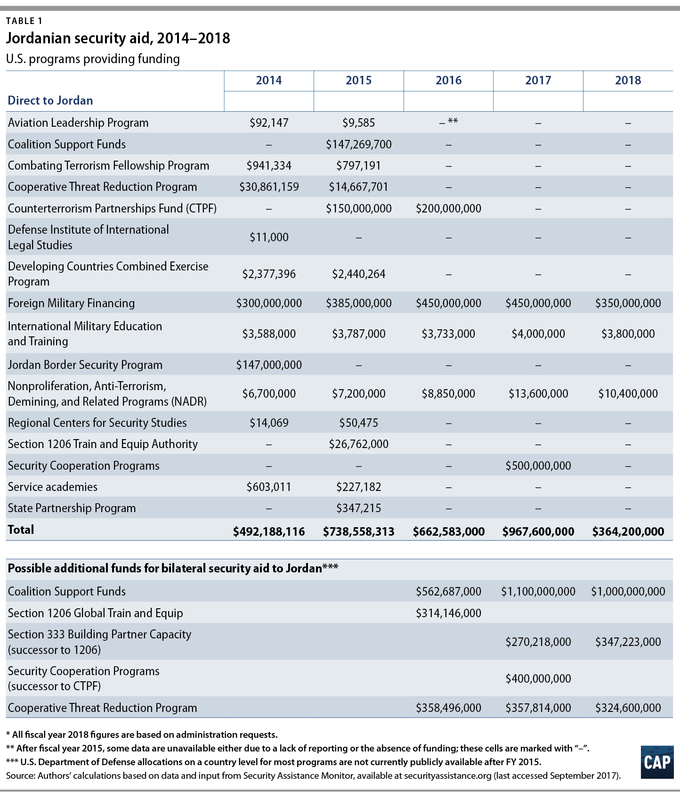 In the summer of 2017, however, the new chairman of the Joint Chiefs of Staff of JAF, Lieutenant General Mahmoud Freihat, launched a package of reforms across JAF—many of which appear to be driven by budgetary constraints. The reforms included specific initiatives that could significantly change the shape of the Jordanian special operations community. The first measure deactivated JORSOCOM headquarters and downgraded the highest-ranking special forces commander from a major general to a colonel-rank officer.69 The second measure transitioned the 28th Royal Ranger Brigade out of special operations and integrated it with the regular army as a rapid response brigade. The result of reforms is to condense a three-brigade Joint Special Operations Command down to a single army-specific group—known as the King Abdullah II Royal Special Operation Forces Group—with most support elements, including administration and logistics, stripped away. At the heart of the new group are the 101st and the 71st battalions, which were converted into Special Unit I—special operations—and Special Unit II—counterterrorism. While Jordanian special forces previously had 7,000 operators on paper, U.S. special forces officials shared that the actual number was significantly lower and that JORSOCOM had faced challenges in maintaining the force at full strength.71 Further, the official number of operators would be reduced to 1,000 as a result of the reforms.72 These changes could potentially affect Jordanian special forces’ operational capacity and responsiveness. Looking ahead, senior Jordanian military officials identified three main priorities. First, military losses by IS in Iraq and Syria heighten the threat posed by foreign fighters fleeing to neighboring countries. There is a “need to beef up our border capabilities and ability to contain foreign fighters returning [to Jordan] or traveling to other countries.”85 Partnership with foreign intelligence agencies will be essential both for building the needed technical capacity and enhancing the flow of information on foreign fighters. Second, the GID needs to prioritize the recruitment of new officers. Financial constraints forced the agency to freeze the regular recruitment cycle for years, making hiring sporadic.86 Finally, the domestic attacks over the last two years have convinced GID leadership that the organization needs to expand and deepen its presence at the local level in order to better detect threats and prevent attacks. Though the Gendarmerie and PSD are viewed as competent and professional, Jordanian officials and analysts emphasized that they should not take the lead on major counterterrorism operations.90 In the case of the Karak attack, the Gendarmerie claimed jurisdiction over the attack and responded without the appropriate equipment and skills necessary to complete the operation.91 This resulted in a drawn-out operation with high casualties. The Jordanian Border Guard, part of the armed forces, is responsible for securing Jordan’s borders against incursions. It plays an especially critical role in managing terrorist and smuggling activities along the kingdom’s borders with Syria and Iraq. In this capacity, the border guard controls the United States-funded border security system built to improve surveillance, detection, and interdiction along Jordan’s borders. The Border Guard has evidently been successful in securing Jordan against threats along its borders, but some analysts pointed to corruption among border guards.92 This is specifically a concern as it relates to Jordanian foreign fighters seeking to use bribery and connections to infiltrate Jordan’s borders and carry out attacks within the country. While Jordan’s security agencies focus primarily on containing immediate terrorist threats, its other institutions are involved in programs that seek to address the spread of domestic violent extremism. For more than a decade, Jordan has experimented with various tools to address and contain the spread of violent extremist ideology. The effort began in 2004 with a state-sponsored letter by 180 scholars which promoted peaceful coexistence based on moderate Islamic principles.93 By 2014, Jordan had developed a national strategy to counter violent extremism that included counter messaging initiatives, religious-scholar training, and regulating sermons at Jordanian mosques. With the military defeat of IS in Iraq and Syria, the United States and Jordan are poised to enter the next phase of bilateral counterterrorism cooperation, both in the kingdom and the region more broadly. As they do so, it will be important to keep in mind some of the central lessons that have emerged from previous chapters of cooperation, as well as recent trends and events in Jordan. Finally, a former Jordanian military officer underscored that the Syrian conflict has both forced the GID to significantly expand its external capabilities and provided significant collection and training opportunities.105 Today, the GID claims to be active in southern Syria and to have the capability to lead operations there independently. In both Iraq and Syria, the GID has assisted the United States’ operations by recruiting informants and gathering intelligence on IS and Al Qaeda.106 It has also supported U.S. training programs for Syrian rebels fighting against terrorist groups in Syria. On the other hand, the reorganization of the command and downgrade in the rank of its commander risk diminishing the operational capacity and the interagency standing of the command inside the Jordanian government. Furthermore, the removal of the Ranger Brigade could affect recruitment. This brigade has been the main talent pool for special operations operators, meaning the Jordanian special operations forces may need to look elsewhere for recruits. Jordan recently took important steps to improve coordination across the security services, but much work remains to be done. Following the recent spate of security incidents and attacks, King Abdullah dismissed the leaders of almost all security agencies, including the JAF chairman of the Joint Chiefs of Staff.113 A senior U.S. diplomat shared that some of these leaders were known for competing rather than coordinating on counterterrorism operations.114 Jordanian and American security officials interpreted their dismissal as a clear signal that inter-service competition would no longer be tolerated. The king also strengthened the National Center for Security and Crisis Management to better coordinate during security incidents. At the tactical level, steps have been taken to improve coordination specifically between the GID and Jordanian special forces. Special Unit II works closely with the GID on counterterrorism, conducting counterterrorism training and operations every few months. But these joint operations are usually soft-knock missions, or missions where forces enter a target location, such as a home or other building, with permission from the occupants. While such missions go smoothly, tactical cooperation breaks down in hard-knock missions, or operations where forces encounter friction or resistance from the occupants. Both U.S. and Jordanian special forces officials were also concerned that Jordan may not be prepared to contain two security incidents in different parts of the country.115 If this situation arises, the National Center for Security and Crisis Management will be critical in responding to and coordinating simultaneous operations. Despite membership in the anti-IS coalition, direct operations undertaken by Jordan against the group in Syria and Iraq have been limited. This can be attributed to two main factors. First, the Jordanian government is hesitant to undertake operations against terrorist groups specifically in southern Syria because of cross-border tribal connections.116 Local IS and Al Qaeda affiliates are thought to have recruited fighters from tribes that straddle the border between Syria and Jordan.117 These tribes are an important source of support for the Jordanian monarchy and strikes against their Syrian brethren by the Jordanian military could carry political risk for the king. It will be important for Jordan’s leadership to put forward a clear vision for the future of Jordanian special operations—both inside Jordan as well as to U.S. leadership and other partner nations. Jordanian military officials present the current reform plan as an effort to build a leaner, more capable special operations force. But there are real concerns that reform portends a diminished special operations force over time when there is little reason to expect that Jordan’s threat environment will improve. As the former commander of JORSOCOM, King Abdullah is perceived by many as the champion of the organization. His leadership was essential in establishing Jordanian special operations forces as among the finest in the region and in building a world-class training center at KASOTC. That leadership is once again needed in explaining how a reduced special operations force fits into the kingdom’s wider counterterrorism strategy. The United States should work with Jordan’s reformed special operations group to ensure that the realignment of the 28th Royal Ranger and 5th Special Operations Aviation brigades do not undercut the capabilities of the command. Specifically, the U.S. Central Command and Special Operations Command should make continued support for the Aviation Brigade contingent upon the former providing airlift and other resources to Special Unit I and Special Unit II as required and in a timely fashion. The United States should also push for joint exercises that require the special forces units and the aviation brigade to work together in real time to help ensure that capability and response times are not compromised as aviation is separated from the command. Additionally, the United States should focus its support of Jordan’s special operations forces on maintaining the quality of recruits for the remaining special operations units, in particular Special Unit I and Special Unit II. With the integration of the Ranger Brigade into the regular army, Jordanian special operations forces will lose their main pipeline for recruitment. They may be forced to draw on regular units inside the armed forces for recruits that lack ranger, airborne, or other advanced and irregular warfare qualifications. To compensate, U.S. special operations forces in Jordan should take advantage of their close relationship with their Jordanian counterparts to maintain or even increase the rigor of the special operations forces selection process. The United States should maintain its engagement with and support for Jordanian special forces at levels required to maximize the outcome of the reform plan. As that plan moves forward, a series of factors is likely to put downward pressure on the size of the U.S. special forces presence in Jordan. First, U.S. special forces may have less access to the Jordanians’ Ranger Brigade and the 5th Aviation Brigade as they realign out of the special forces community. Second, it is only natural that a reduction in the overall size of Jordanian special forces would lead to calls in the U.S. executive branch and Congress to reduce the American commitment. Third, the U.S. special operations presence in Jordan is reportedly slated to be downsized in 2018 due to requirements elsewhere in the region and other arenas. While the United States will need to right-size its support for a smaller Jordanian special forces over time, it should maintain a presence in Jordan large enough to ensure continuity of support for Jordanian special forces until the reorganization is finalized. The United States should use its support for Jordanian special operations forces to encourage it to participate in more joint operations with the United States outside of Jordan. This will not be easy. Jordan is understandably reluctant to adopt a more aggressive military posture in the region. Over time, however, more joint operations between Jordanian and U.S. special operations could play an important role in strengthening Jordan’s ability to unilaterally manage both internal and external terrorist threats. Such capability will be useful, given the potential for continued and increasing instability across the region and in particular in southern Syria. Jordanian military officials believe that the experience of operating alongside foreign counterparts in Afghanistan and Iraq made a significant contribution to the growth and professionalization of the GID’s counterterrorism directorate.120 However, Jordanian policymakers reportedly did not grant their special operations forces the same freedom of action in Afghanistan. As a result, Jordanian special forces had less opportunity to hone their skills in cooperation with American forces. The U.S. special operations presence in southern Syria offers an opportunity to begin to address this shortfall. Jordanian operators already reportedly participate in very small numbers with U.S. special operations forces in southern Syria. Expanding those operations as well as the role of Jordanian special forces could provide them with useful experience. But this opportunity may be limited by the timeframe of U.S. special operations forces’ role in the counter-IS campaign—particularly those forces operating out of the base at Tanf, Syria, close to the Jordanian border.121 The United States and coalition forces have closed some outposts in southern Syria and may withdraw from Tanf in coming months.122 In addition, the United States and Jordan may wish to explore opportunities for joint operations in theaters outside the latter’s immediate neighborhood, where Amman’s sensitivities and concerns may be less acute. Jordanian security officials have recognized weaknesses in coordination among security institutions and taken promising recent steps to correct these deficits. The United States should advise and support the National Center for Security and Crisis Management to run exercises in managing and responding to incidents of terrorism. These exercises should mobilize the participation of armed forces, security services, and ministries with a counterterrorism portfolio to enhance interagency coordination and cooperation. The United States could also support the GID and Jordanian special operations forces to undertake more tactically demanding joint operations. One option would be to carry out joint operations in an expeditionary environment—in southern Syria, for example. Such joint operations could be embedded with U.S. special operations teams, much as Jordanian special operations forces are currently operating next to their American counterparts in support of Operation Inherent Resolve. Though the conventional military campaign against IS is winding down, the United States and Jordan will continue to face shared threats from IS operatives, Al Qaeda, domestic extremism, and Iranian power projection in the Middle East. The United States should maintain its close cooperation with Jordanian special operations forces and intelligence while building their capacity to contain internal security threats and coordinate across agencies. Support and oversight from the United States will be especially critical to ensuring Jordan’s success as the country restructures its security sector. Additionally, the United States should encourage Jordanian special forces to expand their participation in operations beyond the country’s borders. This would provide the forces with valuable operational experience that will prepare them to independently address evolving and increasing threats along Jordan’s borders. Hardin Lang is a senior fellow at the Center for American Progress. Alia Awadallah is a research associate for National Security and International Policy at the Center. William F. Wechsler is a senior fellow at the Middle East Institute.